This cap is a fond reminder of a Minor League team gone extinct. The Bakersfield Blaze were founded in 1941 as the Bakersfield Badgers and played their games at Sam Lynn Ballpark throughout the team’s lifespan. The team would play as a minor league affiliate for numerous teams throughout its lifespan and would change monikers just as often, finally resting on the Blaze name in 1995. The franchise would exist all the way up until 2016, where rumors of a relocation and league change were put to rest by an announcement of the team folding. The High Desert Mavericks would also bow out alongside the Blaze on September 12th, 2016. The Blaze moniker came from the fact that it just plain gets hot in Bakersfield during the summer (up to 110 degrees). Games also had to be postponed until after the sun went down thanks to the ballpark being constructed with the batter facing the setting sun. Games usually commenced well after 8:00 PM thanks to this idiosyncrasy. Padres players (and manager) of note to pass through Bakersfield (though the team was never affiliated with San Diego) include James Shields, Mike Piazza, Yasmani Grandal, Mark Langston, Edinson Volquez, Larry Bowa, and Graig Nettles. Nettles is known for “running the team into the ground” during his short tenure as manager for the 1996 Blaze, finishing his only season with an abysmal 39-101 record. 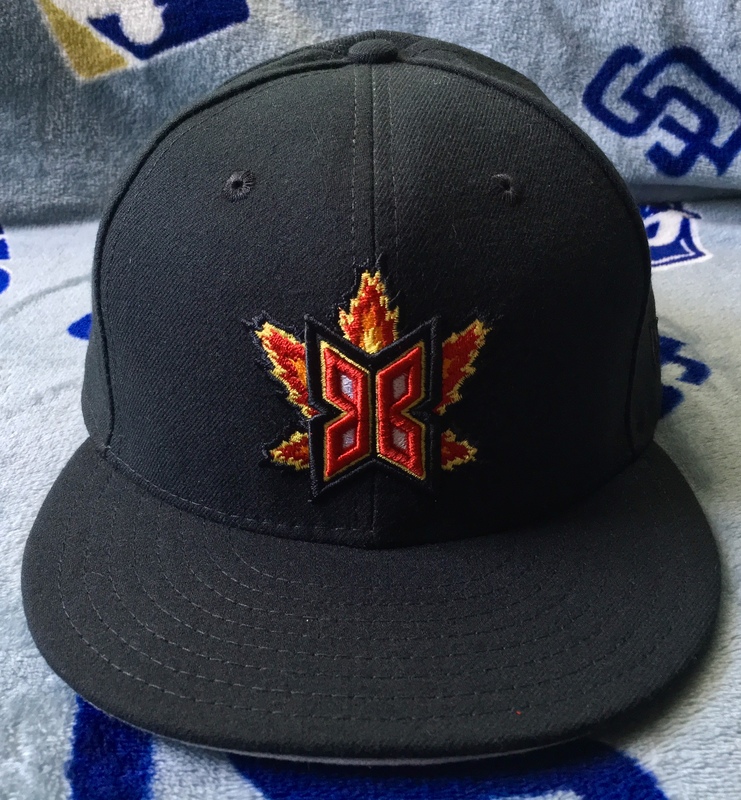 This particular version of the Blaze cap is not the official on-field; it is instead a close remake made by Hat Club. The on-field logo was very similar but featured more layers within the two Bs. There’s very little history that I can dig up on this particular logo but one can make out some interesting connotations within the design. The black color is meant to represent the oil industry in Bakersfield; the orange represents the agriculture…especially oranges. Here’s a closer look at the front logo and embroidery detail. The actual on-field features a different mix of colors for the interior detail. The rear MiLB logo is done up in orange, black, and white. The underbrim is gray and is paired with a black sweatband. This particular version of the cap is available only through Hat Club. Since Hat Club only generates caps in limited runs I suggest grabbing it if you’d like to add it to your own collection.